Tuesdays & Thursdays—ongoing, 9:15–10:45 a.m.
Woodland Park Zoo, Group Health, and Seattle Parks and Recreation invite you to join Senior Zoo Walkers, which promotes fitness for people age 50+ and socializing in a beautiful setting. Fitness leader warm-up at 9:15 a.m. The cost is $15 for 12 weeks. Mail check (payable to Woodland Park Zoo Society) with name, address and phone number to: Woodland Park Zoo, Ed. Dept./Classes, 601 N 59th St, Seattle 98103. For more information, contact Mari Becker (206-684-4664 or mari.becker@seattle.gov) or visit www.seattle.gov/parks/seniors/soundsteps.htm. Seattle Parks and Recreation supports "Momentia," the movement to welcome, engage and empower those living with dementia in our community. Winter activities include Minds in Motion—a weekly fitness class designed for people living with Early Stage Memory Loss; Arts in the Park Watercolor Painting—an opportunity for park exploration, socializing, and creative expression; Remember the Hungry—a monthly opportunity for those living with Early Stage Memory Loss to give back to the community and build meaningful relationships; snowshoeing; a zoo walk; and more. The department is a member of the Alzheimer's Services Coalition, building a dementia-friendly Seattle. For information on classes and activities for individuals with dementia, click on the image. For more information, contact recreation specialist Mari Becker (206-684-4664 or mari.becker@seattle.gov). Get your life back by attending this nationally acclaimed free caregiver training. Register online at www.eads-cares.org. For more information, contact Amber Schneider (425-250-7046 or aschneider@eads-cares.org). Tuesdays, January 7–February 11, 2014, 12:00–1:30 p.m.
Register now for Taking Care of You: Powerful Tools for Caregivers, a series of six workshops offered during a long lunch hour in the Seattle Municipal Tower, for City of Seattle and other downtown employees. Powerful Tools for Caregivers is an evidence-based educational series that provides unpaid family caregivers with the skills and confidence needed to better care for themselves while caring for others. Caregivers develop a wealth of self-care tools to reduce personal stress, communicate their needs effectively in challenging situations, deal with difficult emotions, and make tough caregiving decisions. The workshop series is free. Space is limited. Pre-registration and full attendance is required. A registration link will be established shortly. Hosted by the Seattle Human Services Department/Aging and Disability Services. For more information now, contact Carlos Pulido (206-615-0802 or Carlos.Pulido@seattle.gov). Tuesdays, January 7, February 4, March 4 & April 1, 2014, 2:30–4:00 p.m.
Wednesdays, January 29, February 26, March 26, April 30, 2014, 2:30–4:00 p.m.
Wednesday, January 8, 2014, 4:00–5:30 p.m.
Join a presentation and discussion about positive end-of-life experiences. Presenter Dori Gillam, Aging Your Way program manager at Senior Services, will perform "Save My Place," a 15-minute story based on the last three weeks of her mother's life, which was filled with love, visions and peace. Share positive end-of-life experiences that you have witnessed, receive ideas about how to have delicate and pragmatic conversations about death and dying with your loved ones, and begin to plan what you may want for yourself. Free. For more information, call Greenwood Senior Center at 206-297-0875. Thursday, January 9, 2014, 9:30–11:30 a.m. The Northwest Universal Design Council invites you attend a presentation on the 50+/Accessible Housing Industry, featuring Tim Dickey, a Certified Aging in Place Specialist, Certified Graduate Remodeler, and Certified Green Remodeler (Dickey's Remodel & Repair) and Jan Rohila, Education/Membership Services Director, Building Industry Association of Washington (BIAW). Learn and discuss the challenges, opportunities, and successes of promoting Universal Design within the construction industry. Includes time for Q&A. For more information, e-mail info@environmentsforall.org or visit www.environmentsforall.org. Thursdays, January 9 & February 6, 2014, 11:00 a.m.–12 p.m.
TED (Technology Entertainment Design) is a nonprofit organization devoted to sharing ideas worth spreading. TED offers more than 900 talks online. Come to the Greenwood Senior Center to view talks and then participate in an in-depth discussions led by Carin Mack. Free. For more information, call Greenwood Senior Center at 206-297-0875. Thursday, January 16, 2014, 8:30–10:00 a.m. The Round Table Discussion Group for Professionals in the Field of Aging meets monthly for interactive and meaningful dialogue about current research and clinical practice. It provides opportunities to interact with community professionals who may be working with similar clinical issues, each from a unique perspective. In advance of each gathering, participants are asked to read a piece of research literature about a clinical issue in aging that provides the framework for the group discussion. The January topic is "Dementia: Lies & Deception—Is It Acceptable?" Facilitated by Barbara Green, MSW. For more information about the series or to register, call 206-799-7108, e-mail bgreenmsw@earthlink.org or visit www.bgreenmsw.org. Thursday, January 16, 2014, 10:00–11:00 a.m. The Seattle Mayor's Office for Senior Citizens brings community elders closer to City officials at monthly coffee hours, where they can explore topics of interest to older adults. In January, meet Councilmember Tim Burgess. Senior Coffee Hours are held downtown on the third Thursday of every month, and at a variety of locations in Seattle. For more information, call 206-684-0500, e-mail seniors@seattle.gov or visit www.seattle.gov/seniors. Tuesday, January 21, 2014, 5:00–7:00 p.m.
Make Change! is a free two-hour class that will help you to address debt-related issues, figure out when you need an attorney, and what you can do on your own, and provide information on finding help. Topics include assessing your debt situation, options for resolution, available resources, dealing with debt collectors, your rights, negotiating, how to respond to a collection lawsuit, garnishments, bankruptcy, protections, and when to use an attorney. RSVP to reserve your place by calling 206-267-7095. Greenwood Meaningful Movies: "The Story of Cosmetics" and "Fairly Foul"
Friday, January 24, 2014, 1–3 p.m. Hundreds of the products we put on our skin everyday contain toxic substances that are linked to serious health and environmental problems. It doesn't have to be this way! Join friends at the Greenwood Senior Center for this thought provoking double-header—two short films that strive to give cosmetics and personal care products a makeover—followed by a facilitated discussion about these hidden toxins and what we can do to move the industry away from chemicals and towards safer alternatives. Healthy snacks and action steps provided. Coordinated by Shannon Markley. Free. For more information, call Greenwood Senior Center at 206-297-0875. Saturday, January 25, 2014, 9:30 a.m.–12 p.m.
What's shaking? If you or someone you care about shakes a lot, it could be Essential Tremor (ET) or some other movement disorder. ET is a progressive neurological condition that can cause the hands, head, voice, legs or trunk of the body to shake and can cause significant disability. It is often confused with Parkinson's Disease or Dystonia. Many people with ET never seek medical care, though most would benefit from treatment. Guest speakers Dr. Ryder Gwinn and Dr. Sindhu Srivatsal will explain causes, diagnosis, research and treatment options. Presented by the International Essential Tremor Foundation in partnership with Swedish Neuroscience Institute, the event is free; however, parking in the Bellevue Hilton lot is $5. Registration is required—call 888-387-3667 or visit www.essentialtremor.org/seminars. 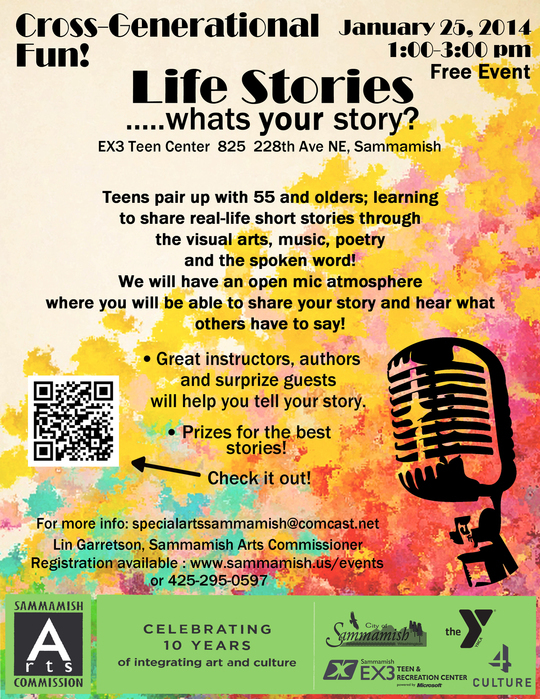 Saturday, January 25, 2014, 1:00–3:00 p.m.
Life Stories is a cross-generational event pairing teens with 55+ adults. The focus is on sharing life stories and experiences through interviewing, storytelling, writing, poetry and visual art. Facilitated by published writers, poets, and illustrators, this free event is sponsored by the Sammamish Arts Commission. To register online, click here. For more information, call 425-295-0597 or e-mail Lin Garretson, Sammamish Arts Commissioner at specialartssammamish@comcast.net. Tuesday, January 28, 2014, 1:00–2:00 p.m.
Join the Wallingford Community Senior Center on fourth Tuesdays for "happy hour"—a monthly special event, speaker, or practice to help you find happiness. The first event features tips and tools that researchers have shown can make us feel hopeful, happy, and satisfied, presented by Rebecca Crichton, Northwest Center for Creative Aging. Suggested donation $3 members/$5 general public. Advance registration is appreciated. For more information, call 206-461-7825 or visit www.wallingfordseniors.org. Tuesday, January 28, 2014, 2:00–4:00 p.m.
Are you worried that your lotion or toothpaste might contain toxins? Learn to make homemade alternatives that limit your exposure to harmful chemicals in this practical, and fun, hands-on workshop. $5. For more information, call Greenwood Senior Center at 206-297-0875. Wednesday, January 29, 2014, 2:00–4:00 p.m. Challenge yourself this year! Sound Steps, a member-directed community walking program for people age 50 and older, invites you to train with them for a 5km, 10km, or Half Marathon walk goal this year. Beginning or experienced—all walkers welcome. Start by attending an information session; continue with Saturday morning training walks in the Greenwood neighborhood that gradually increase in distance from February through June. Free. For more information and to RSVP, contact Mari Becker (206-684-4664 or mari.becker@seattle.gov) or visit www.seattle.gov/parks/seniors/soundsteps.htm. Wednesday, January 29, 2014, 7:00–9:00 p.m.
As parents age, they often experience major life changes, including health concerns, reduced income or the death of a loved one. When these changes coincide with depression, mental illness or substance abuse, parents may resist help or become overly demanding. Learn how to recognize these behaviors and help your parents find the support they need. $13 in advance, $18 at the door. Space is limited. Advance registration encouraged. For more information or to RSVP, contact Leonid Orlov (206-861-8784 or familylife@jfsseattle.org). Saturday, February 8, 2014, 9:00 a.m.-1:30 p.m.
You've worked hard for a place to call home, a family, a job, and maybe a few extras. But life's still calling. Finding the time to focus on your future is particularly important for women, who generally have more years to cover in retirement with fewer resources. Come to this community forum—designed by and for women who want to build a successful life strategy for the future. This is an educational forum, not a sales presentation. All participants will receive valuable educational tools and resources. Doors open at 8:30 for check-in. Lunch is provided. Free, but space is limited, and registration is required. To register for the February 8 event, click here. Tuesday, February 18, 2014, 10:00 a.m.–3:00 p.m.
Take action and speak up for the needs and rights of people with Alzheimer's and their families. Learn about the legislative process, meet face-to-face with elected officials, tell your personal story and bring awareness to the importance of policy priorities so legislators can make decisions that will affect caregivers and families. To register, e-mail advocacy@alzwa.org or call 206-529-3867. For more information, visit www.alzwa.org/cms/waadvocacy. Thursday, February 20, 2014, 7:00 a.m.–4:00 p.m.
Stay tuned for more information about the 2014 Senior Lobby Day in Olympia, which starts with an informative off-campus gathering followed by scheduled appointments with state legislators. For more information, visit www.waseniorlobby.org. Register to attend by contacting Karen Bowen, Washington State Senior Citizens' Lobby, at 360-754-0207 or info@waseniorlobby.org. Thursday, February 20, 2014, 8:30–10:00 a.m. The Round Table Discussion Group for Professionals in the Field of Aging meets monthly for interactive and meaningful dialogue about current research and clinical practice. It provides opportunities to interact with community professionals who may be working with similar clinical issues, each from a unique perspective. In advance of each gathering, participants are asked to read a piece of research literature about a clinical issue in aging that provides the framework for the group discussion. The February topic is "Depression: Depletion or Developmental Change." Facilitated by Barbara Green, MSW. For more information about the series or to register, call 206-799-7108, e-mail bgreenmsw@earthlink.net or visit www.bgreenmsw.org. Tuesday, February 25, 2014, 1:00–2:00 p.m.
Join the Wallingford Community Senior Center on fourth Tuesdays for "happy hour"—a monthly special event, speaker, or practice to help you find happiness. In February, learn about "Laughing Yoga!" Suggested donation $3 members/$5 general public. Advance registration is appreciated. For more information, call 206-461-7825 or visit www.wallingfordseniors.org. The Round Table Discussion Group for Professionals in the Field of Aging meets monthly for interactive and meaningful dialogue about current research and clinical practice. It provides opportunities to interact with community professionals who may be working with similar clinical issues, each from a unique perspective. In advance of each gathering, participants are asked to read a piece of research literature about a clinical issue in aging that provides the framework for the group discussion. The March topic is"Geriatric Syndromes: The Frailty Identity Crisis." Facilitated by Barbara Green, MSW. For more information about the series or to register, call 206-799-7108, e-mail bgreenmsw@earthlink.net or visit www.bgreenmsw.org.